Japan is scheduled to launch its first Epsilon solid-fueled rocket next year, deploying a planetary telescope in orbit while demonstrating new low-cost rocket assembly and control techniques, the Japanese space agency announced last week. The three-stage rocket will launch from the Uchinoura Space Center on the south shore of Kyushu, the southernmost of Japan's main islands. The Epsilon program is designed to cut in half the cost of Japanese small satellite launches. Japan's M-5 rocket, which launched seven times before retiring in 2006, cost $94 million per flight. Each Epsilon launch is pegged to cost $47 million, according to Yasuhiro Morita, the rocket's program manager at the Japan Aerospace Exploration Agency, or JAXA. 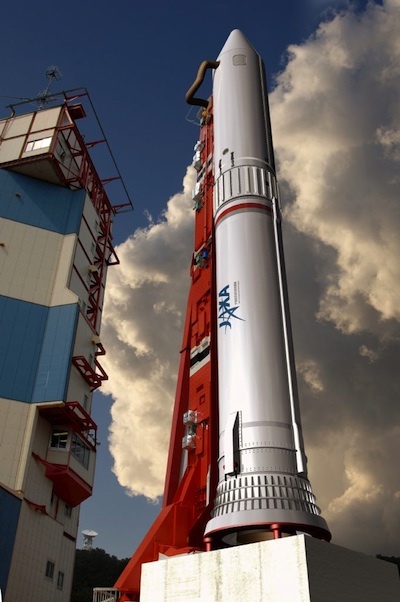 The Yomiuri Shimbun newspaper reported last week the first launch of an Epsilon rocket is scheduled for August or September of 2013. Engineers designed the Epsilon rocket with a simplified control system, and the vehicle's own computers will autonomously monitor the status of its systems during a countdown. Only a handful of engineers with laptop computers are required on the launch control team, according to JAXA. The Epsilon is also designed to launch after only seven days of assembly on the launch pad, reducing labor and overhead costs. The M-5 rocket, which the Epsilon will replace, took several weeks of processing and dozens of controllers for each mission. JAXA has worked on the Epsilon rocket since 2007, and the development is expected to cost 20.5 billion yen, or about $255 million, Morita told Spaceflight Now. Workers are modifying the M-5 launch pad at Uchinoura to accommodate the Epsilon rocket. JAXA is installing a 30-foot-high pedestal and a new flame trench underneath the oceanfront complex, according to Morita. The 78-foot, 100-ton booster can lift up to 2,600 pounds into low Earth orbit. The Epsilon's first stage is based on the H-2A rocket's strap-on booster, while the second and third stages will use heritage solid-fueled motors from the M-5's upper stages. IHI Aerospace Co. is the Epsilon rocket's prime contractor. The company builds the H-2A solid rocket boosters and previously held the lead contract for the M-5 rocket. Epsilon's first launch will orbit the SPRINT-A satellite with a small telescope to observe Mercury, Venus, Mars and Jupiter. The approximately 700-pound spacecraft will carry an extreme ultraviolet spectrometer to study the interaction between planetary atmospheres and the solar wind. The second Epsilon flight in 2015 will launch Japan's Energization and Radiation in Geospace, or ERG, satellite, Morita said. According to Morita, officials have not selected a payload for the third Epsilon launch in 2016.